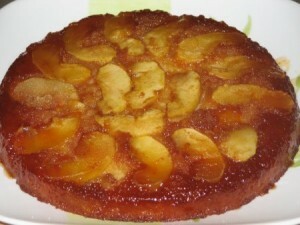 Apple Tatin Cake recipe by bestchefs at DesiRecipes.com. 1 CUP SUGAR, 1/3 CUP WATER, 2 APPLES. BEAT BUTTER WITH SUGAR UNTIL GET SMOOTH MIXTURE. NOW ADD EGGS ONE BY ONE BEAT THEM WELL. ADD VANILLA ESSENCE AND BEAT IT ON SLOW SPEED. NOW FOLD GENTLY ALL DRY INGREDIENTS INTO THE WET (EGG N BUTTER)MIXTURE. PEEL APPLES AND CUT THEM INTO WEDGES. NOW IN THE PAN POUR WATER AND 1 CUP SUGAR AND COOK ON LOW FLAME UNTIL CARAMALISE. POUR THIS MIXTURE IN YOUR BAKING PAN AND ARRANGE APPLE WEDGES ON IT. THEN POUR ALL CAKE MIXTURE OVER IT AND BAKE IT ON 350* PREHEATED OVEN FOR 30-40 MINS.